Mark Shapiro takes all the questions during his presentation and answers them all thoughtfully, even the one from a four-year-old who wants to know what a “PG” rating is for a movie. He has packed the house at Hillsboro library to talk about Laika Studios and their work on a snowy winter night at the outskirts of Portland, Oregon, where the studio is located. 2017 started with a bang for Laika, having just received two more Oscar nominations for Kubo and the Two Strings at the end of January and with their exhibit From Coraline to Kubo: A Magical Laika Experience at Universal Studios Hollywood closing January 15, 2017. Still, Shapiro, Laika’s marketing and brand manager, has come out in the unseasonably cold weather to tell the children about how Laika makes their movies, and to tell this interviewer about his special passion for Estonia and Estonian animation. Laika, the first dog in space, inspired the studio’s name, and Shapiro compares the studio to a “little barker,” playing with the giants in the animation world. From a commercial advertising studio that produced the California Raisins’ 1986 I Heard It Through the Grapevine commercial for the California Raisin Advisory Board, to when Phil Knight assumed a 15% stake in the studio in 1998 and when his son Travis took over as CEO in 2002, Laika has seen a lot. Shapiro has seen a lot, too, and one of his favorite things so far has been Estonia. What is your connection to Estonia? I met the legendary Priit and Olga Pärn at a film festival in Rio seven years ago. 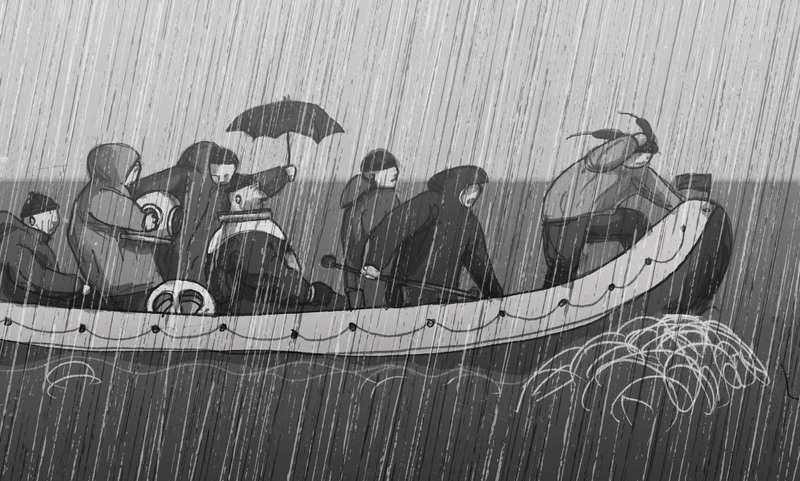 They are spectacular visionaries of animation, of Estonian culture – really of world culture. In the animation community, and of course all over Estonia, they are beloved and they invited me to their festival, Animated Dreams in Tallinn, which I later attended in the heart of the winter chill. Tallinn is a vibrant city, with spectacular galleries, architecture… the vibe of the city is enriched by an incredible humor and warmth – even when the temperatures were ice-cold outside. You have mentioned the connection between stop-motion animation and dark themes. Do you think it’s a chicken or an egg question: do the animators give the films dark themes, or does the stop-motion process itself somehow encourage the dark themes? Puppets have a personality all their own, even when they’re not moving. And when they are animated, there is something about that that gives them this sense of life. Puppets are perceptible, tactile and the animator breathes life into the puppet, 24 frames per second. Do you have a favorite Estonian animation? Is it Night of the Carrots [directed by Priit Pärn]? I have a number of favorites, including Olga and Priit Pärn, Priit Tender, Kaspar Jancis and Anu-Laura Tuttelberg. Anu-Laura did an incredible first film called The Fly Mill, with spectacular depth, a beautiful score and stirring puppets and sets. Have you ever pulled any animators from Estonia to work at Laika? We haven’t, but you know, Nukufilm studio in Estonia is so strong. One stop-motion feature I love from Nukufilm is Lisa Limone and Maroc Orange: A Rapid Love Story. It’s a rock opera of sorts featuring a cast of spectacularly unique characters. Nukufilm and Eesti Joonisfilm have dominated the Estonian animation field and now smaller animation projects are popping up. How do you see the animation scene developing there? In fact, Nukufilm is very similar to our studio [Laika] and I could definitely see a rise in independent films springing from the creativity fostered by Nukufilm. The world of Estonian animation is on everybody’s list of top films at some of the best film festivals around the world. Can you say anything else about Estonian animation? I think Estonian films are unique and proven; comedic, tragic, irreverent, often with world class scores. The best of the best. Laika has really embraced the meeting of art and science and engineering. Has that ever offended purists or has there ever been any pushback? Creativity has so many components and it grows with technology. We embrace the collaboration of art and science in our features. We make stop-motion films but our VFX artists enhance scenes with another form of artwork in the style of mind-boggling visual effects. The result is an exciting blend of hand-moved puppets with stunning technology. How can parents make sure their children are exposed to quality animation? What is quality animation, anyway? You can find exhilarating films through a number of resources, including your own library. But, looking deeper, I find great animated content via a number of websites, but I would highlight the National Film Board (Canada) and ACMEfilmworks’s Show of Shows. You have to be very selective and curate your content so that it’s age-appropriate and also top quality. Many of Laika’s films have themes that are for adults as well as children. Have there been any negotiations in order to keep a PG rating for the films? The integrity of storyline is key. We make films for families with themes that are universal. Thus far all of our films have carried that rating. Shapiro closes the public presentation with the nitty-gritty details of Laika’s work: the largest stop-motion puppet ever made (the skeleton in Kubo) and the smallest (Little Hanzo in Kubo) and how 3-D printing doesn’t really save any time, because the bottom line keeps moving up. More than 35,000 faces were printed for Coraline, while Kubo had more than 22 million facial expressions thanks to improvements in printing. Shapiro sees Laika as a small studio pulling ahead through technology and vision – “punching above its weight,” one could say. Before he drives off into the winter night, he tells the interviewer to call him before she goes back to Estonia in the summer; he has some gifts he wants to send back to his friends. Erin Crouch lives in Portland, Oregon and Tallinn, Estonia. She likes Estonian animation so much that she went on tour with it. She also uses Estonian beauty products.